The adaptability of this product is perhaps the most important feature that can be discussed. What we mean by that is it is compatible with a wide range of roofing materials, so subsequently you can use it for your vehicle regardless of the texture of the roof. This makes things a lot easier for the customer, but at the same time it ensures the chances of success regardless of the carelessness of the the one applying it, so you can afford to pay less attention to some details than you would otherwise. Among the materials compatible with this formula you will find EPDM sheeting, aluminum, mortar, wood, vinyl, concrete and galvanized metal. According to the customers that reviewed this alternative, it does its jobs really well. However, the problems that occurred were significant because of improper work conditions, such as warm weather that prevents the sealant from leveling correctly. We suggest you strictly follow the instructions from the manufacturer if you want to avoid any such incidents. Also, another aspect worth mentioning is the fact that the price is believed to be a little too high, primarily because it takes a large quantity of this sealant to cover an entire roof and one container won’t do the trick. Perhaps one of the most crucial purposes of a good RV roof sealant is that it needs to offer protection for the inside of the vehicle. It needs to insulate the horizontal surface of the roof correctly and in this way prevent water infiltrations and dirt or debris from getting inside. This item does that and more. It’s also color matched and provides a UV stabilized surface that will reflect the harmful sun rays which might otherwise, in time, affect the efficiency of the layer by gradually damaging it. Deterioration and discoloration will be avoided. Also, in relation to other materials that you may also want to apply on top of this surface, it won’t stain or discolor them. This model comes in the form of a 10.3-ounce tube, which makes application a lot easier for many users. 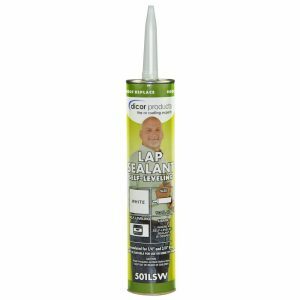 It can create a watertight surface that will seal the roof edges and go on to insulate other significant areas such as air vents, vent pipes or screw heads. Basically, you’ll be able to create a perfectly horizontal surface that will include all the significant declivities on the geometry of the roof. It remains flexible long after it has been applied, which reduces the chances of crack or tears appearing and thus ruining the protective layer. One of the features that customers are really enthusiastic about is how easy you can apply a product. The less effort it takes, the more interest it raises. In our case, this is a self-leveling formula that comes in a spray form, so it’s pretty easy to apply, and after that, you only need to let it sit, dry and do its job, aside from using other tools. This long-lasting finish will cover all the declivities of the roof so it is strongly suggested that before you take the step and apply a sealant, you carefully clean the surface, because any dirt or debris left will be stuck underneath and will defeat the purpose of using the formula.